I’m at it again. Calling brands, working the corporate phone chain, sending emails, filling out contact forms, and in general not getting anywhere fast. 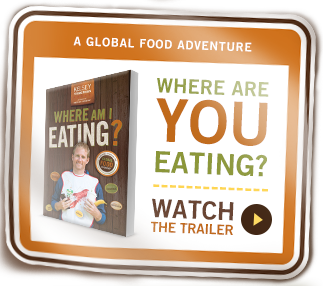 I’m working on a new book project – WHERE AM I EATING – out in the spring of 2013. In March I was in Costa Rica working as a banana worker and soon I’ll be on a coffee farm in Colombia. Whole Foods and EARTH University worked with me to arrange my banana farm visit and I’m so grateful. There you have two major institutions kind enough to help me. Awesome! But that’s not always the case. If we’re allowed to know where our shoes come from, shouldn’t we be allowed to know where our food comes from? One of the best examples of a transparent supply chain just keeps getting better; Patagonia’s Footprint Chronicles, which I mention in the new edition of WHERE AM I WEARING? , has just been expanded and updated. You can see all of Patagonia’s suppliers and virtually visit them. This is the future of producer–brand–consumer relations. The veil is being lifted. I have Facebook friends that work at factories in the developing world. The arc of the future bends toward transparency. Any company that refers to their farmers or suppliers as “proprietary information” is going to fall behind. Proprietary information in my mind is terms and conditions of sale, pricing — essentially information that could provide a competitive advantage. The identification of a vendor/partner is hard to keep confidential anyway. Patagonia is a shining exmaple — I just wish they made clothes for people over 6′:) and weighing more than 150lbs — big people hike and run too! Go get em Kelsey. Larry, I agree. Everybody knows where everybody else is sourcing from. It’s funny how many adjectives food companies will use to describe the quaint place their food comes from, but they don’t ever identify it. Patagonia XXL isn’t working for you? I find that there sizing is smaller. There XL is smaller than a normal XL. I wear either a medium or large in most of their items. Typically with other brands I’m a large or XL. I think XL or XXL would fit you fine. That said, you don’t see big bird wearing much Patagonia! Excellent article. I will be facing most of these issues as well..